Experience the Star Trek Universe like never before! The first original 10 films remastered plus over 8 hours of special features. For the first time in Star Trek history nearly every frame of the final frontier is brought together in one brilliantly re-mastered motion picture Blu-ray box set. Discover the Star Trek Universe and experience every unforgettable moment from Kirk's triumphant return to the bridge of the U.S.S. Enterprise in Star Trek: The Motion Picture to Picard, Data and the crew of the U.S.S. Enterprise-E's final battle for control of the universe in Star Trek Nemesis. 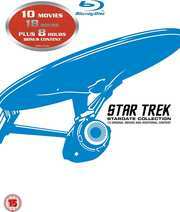 The spirit of the Enterprise lives in the heart-stopping action and unforgettable characters of this one-of-a-kind collection. Special Features: Commentary by director Nicholas Meyer and Manny Coto / Starfleet Academy SCISEC Brief 002: Mystery Behind Ceti Alpha VI / Collecting Star Trek's Movie Relics / James Horner: Composing Genesis. Special Features: Commentary by director Lenoard Nimoy, writer/producer Harve Bennett, director of photography Charles Correll and Robin Curtis / Commentary by Ronald D. Moore and Michael Taylor / Library Computer / Production / The Star Trek Universe / Theatrical Trailer / Easter Egg: That Darn Klingon Dog / BD-Live - Star Trek I.Q. 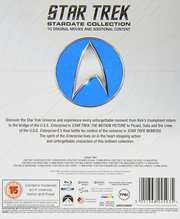 Special Features: Commentary by William Shatner and Leonard Nimoy / Commentary by Roberto Orci and Alex Kurtzman / Library Computer / Production / The Star Trek Universe / Visual Effects / Original Interviews / Tributes / Theatrical Trailer / BD-Live - Star Trek I.Q. Special Features: Commentary by William Shatner and Liz Shatner / Commentary by Michael and Denise Okuda and Judith and Garfield Reeves-Stevens and Daren Dochterman / Library Computer / Production / The Star Trek Universe / Deleted Scenes / Theatrical Trailers / TV Spots / Easter Egg The Gag Reel / BD-Live - Star Trek I.Q. Special Features: Commentary by director Nicholas Meyer and screenwriter Denny Martin Flinn / Commentary by Larry Nemecek and Ira Steven Behr / Library Computer / The Perils of Peacemaking / Stories From Star Trek VI / The Star Trek Universe / Original Interviews / Farewell / Promotional Material / BD-Live - Star Trek I.Q. Special Features: Commentary by director David Carson and Manny Coto / Commentary by Brannon Braga and Ronald D. Moore / Library Computer / Production / Visual Effects / Scene Deconstruction / The Star Trek Universe / Deleted Scenes / Archives: Storyboards, Production Gallery / Teaser Trailer / Theatrical Trailer / Star Trek I.Q. (BD-Live). Special Features: Commentary by director and actor Jonathan Frakes / Commentary by screenplay writers Brannon Braga and Ronald D. Moore / Commentary by Damon Lindelof and Anthony Pascale / Library Computer / Production / Scene Deconstruction / The Star Trek Universe / The Borg Collective / Archives: Storyboards, Photo Gallery / Teaser Trailer / Theatrical Trailer / Star Trek I.Q. (BD-Live) / Easter Eggs. Special Features: Commentary Jonathan Frakes and Marina Sirtis / Library Computer / Production / The Star Trek Universe/ Creating The Illusion / Deleted Scenes / Archives: Storyboards, Production Gallery / Advertising / Star Trek I.Q. (BD-Live) / Easter Eggs. Special Features: Commentary by director Stuart Baird / Commentary by producer Rick Berman / Commentary by Michael and Denise Okuda / Library Computer / Production / The Star Trek Universe / The Romulan Empire / Deleted Scenes / Archives: Storyboards, Production Galleries / Teaser Trailer / Theatrical Trailer / Star Trek I.Q. (BD-Live) / Easter Eggs.